Coffee Trail - Counting Stars, Reaching Delphi .✫*ﾟ･ﾟ｡.★.*｡･ﾟ✫*. 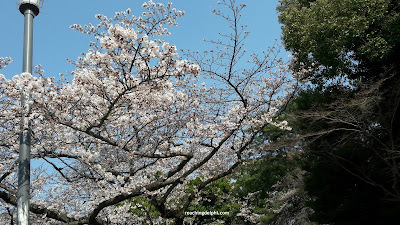 : Japanese Cherry Blossom Trail, Part Two: Humbled Amongst the Flowers of Silence in Nagoya. Below is a picture of the cotton-candy flowers in the early bloom stages. Can you identify the stages based on the sequence listed above? This picture of humbling pink, purple, and white shades against the sun’s rays may seem ordinary, but it is one of my most cherished. I have used it in many posts, and here is why. A wise person once said that a ‘picture is worth a thousand words’. For me, the sun rays are the messages finding their way to me and a reminder that relief will shine through when the time is right. By the way, I wish to remind readers that this post is not from a recent trip, but it’s topic is timely given the season. 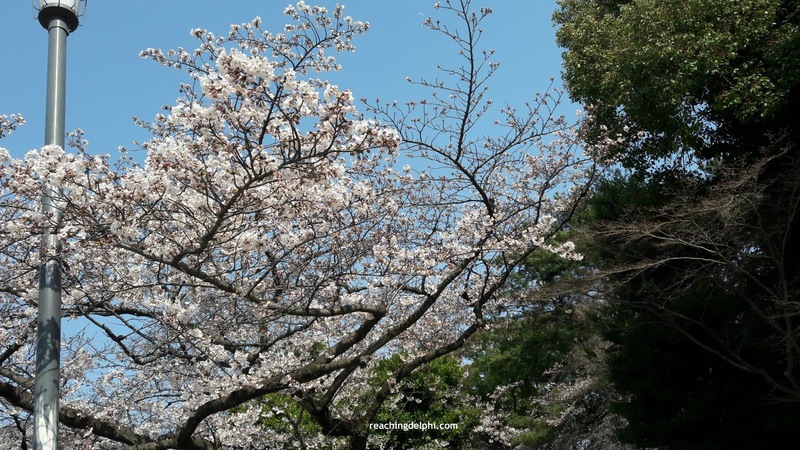 In the US, the National Cherry Blossom Festival is celebrated in the spring of each year in Washington, DC, to commemorate the gift of Japanese cherry trees from the mayor of Tokyo City to DC on March 27, 1912. It represents the symbol of a lasting relationship. Nagoya needs minimal introduction. It is located in the central region of Honshu Island. In terms of size, Nagoya is the largest city in the Chūbu region and fourth largest in Japan. Nagoya’s capital is Aichi Prefecture. Over the centuries, Nagoya has grown into a very prominent industrial hub for the region. Toyota owners, did you know that Toyota’s headquarters is in Nagoya? It is indeed. Nagoya is also known as the castle town of the Chūbu region. 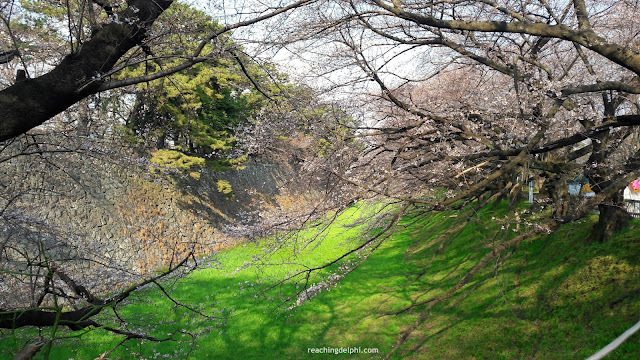 Nagoya Castle is one of the three most famous castles in the country. Speaking of captivating history and the number three, Nagoya is where the three notable daimyo, or feudal lords, of the 17th century—Oda Nobunaga, Toyotomi Hideyoshi, and Tokugawa Leyasu—were born. You will read about them again in a short bit. 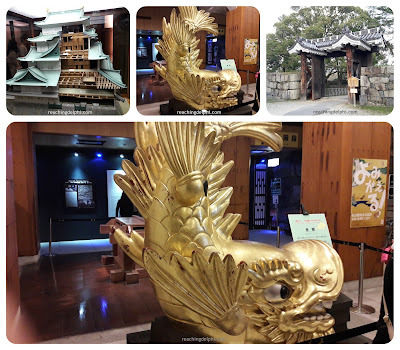 A lot of the Nagoya’s history is centred on these three feudal lords. Just like many other cities in Japan, Nagoya attracts a large number of visitors annually. I am proud to say that I am one of them. One of the reasons for my visit to Japan was to catch up with my two dearest friends, Hiroko San and Shogo San. 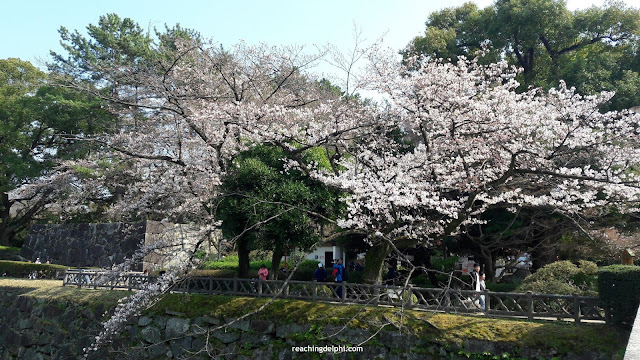 The pink and white sakura, the need for a little breather in between projects at work, and some saved-up money made this vacation to Japan possible. Did you notice I used the word San after their names? San is an honorary title, just like Mr./Ms./Mrs. It’s a respectful way to address a person. I first met Hiroko San, then an expat in Malaysia, many years ago at a local bus stop in the neighbourhood where we both stayed. She was off to meet some friends in Chinatown, and I was rushing off to work. 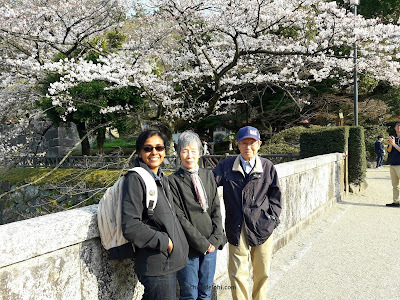 Shogo San, her husband, an engineer, was posted on an assignment to Malaysia. They lived in Kuala Lumpur then. Though they returned to Japan a year or two later, we remained friends. Here is a little secret: I got my first golf lesson from Shogo San. It’s been decades since then. Did I make it to the LPGA squad? What do you think… Regardless, I am glad for the bus that arrived late that morning. Nagoya is also known to have the best Japanese food. Since I am not a food junkie, I am not getting into that area. 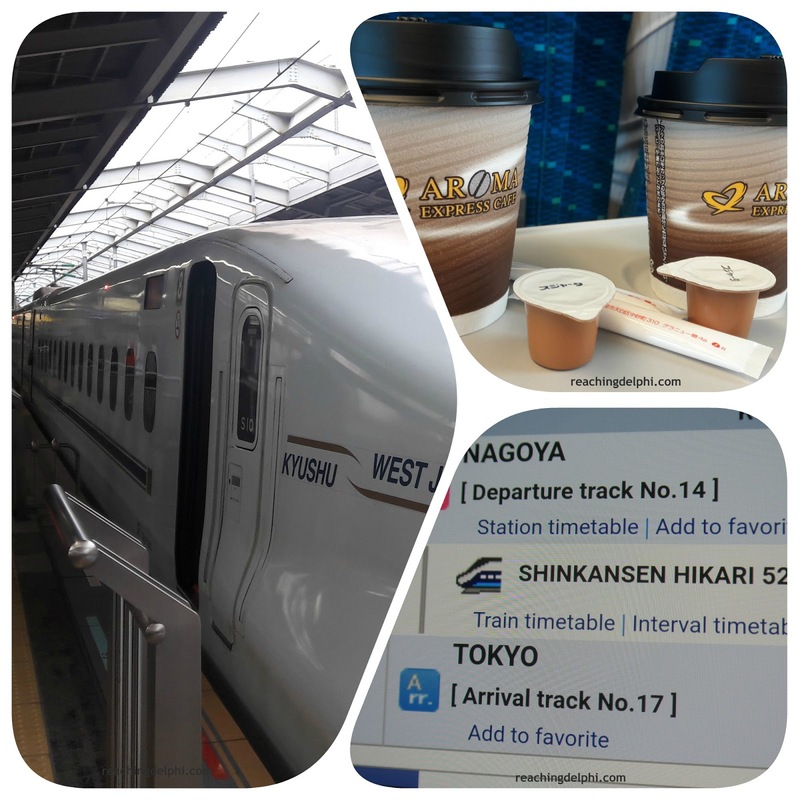 The fastest and most comfortable way is to reach Nagoya from any major city in Japan is by high-speed bullet train. When in Japan, I would recommend you hop on to a super-speed Shinkansen at least once just for the experience. The ride is quality at its height! The cost of individual train tickets can be a pinch to the pocket, so we decided to purchase the Japan Rail Pass. If you are not familiar with how this works or the services it covers, don’t worry. The helpful staff at the stations are always quick to guide and recommend the best domestic travel options. The Japan Rail Pass (JR Pass) worked out well for us. In case you are not aware, the JR Pass is a short-term pass that allows unlimited travel across Japan. It allows the pass holder to ride on almost all regional and local trains and local buses. JR Pass is only available for foreigners, and at the time we visited, this pass could be purchased only through an appointed agent or online, outside Japan. As I understand, today for a limited period, visitors can also buy the pass at major airports and stations too. 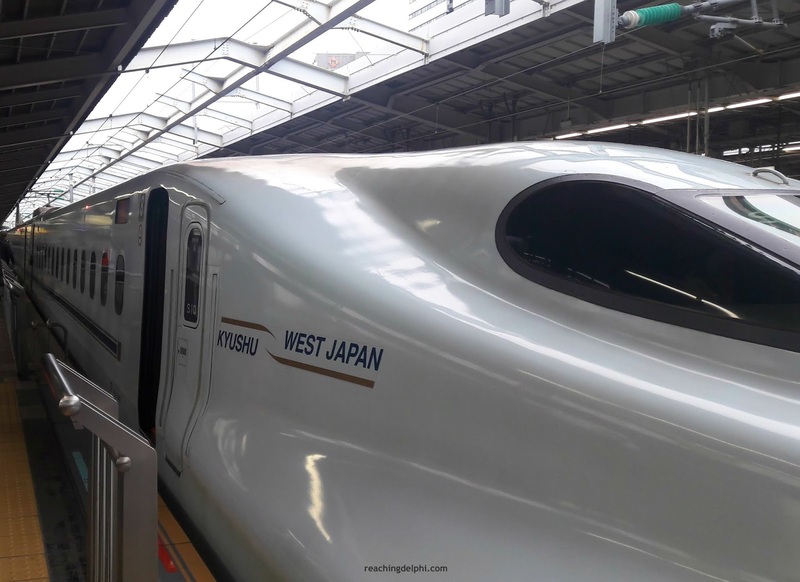 JR Pass is an economical way to travel if you intend to cover long distances within the ticket validity period (7, 14, or 21 consecutive days); otherwise, the rides will turn out to be an expensive option. Prior trip planning is essential to maximise its benefits. If you are travelling to only one region/city, a regional or city pass would be the wiser choice. 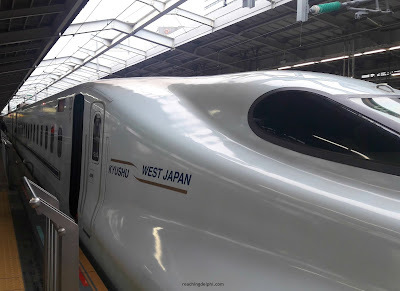 Shinkansen, what an elegant creature! I wished the bullet train ride had been longer for me to enjoy its top-notch comfort, but I was even more anxious to get off when I saw Hiroko waiting at the platform in Nagoya. What Do You Do in Nagoya? 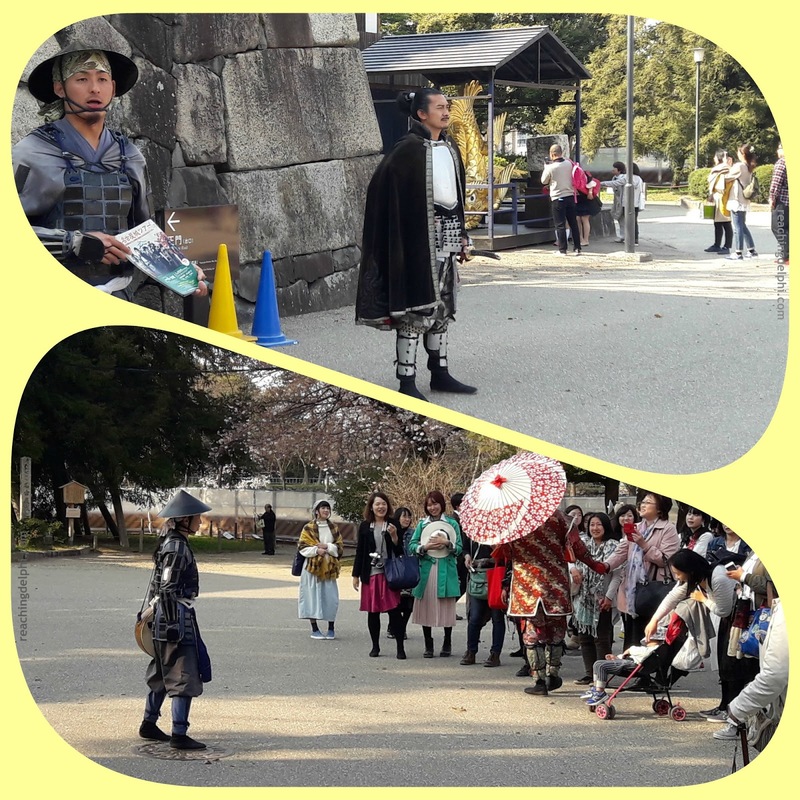 Nagoya Castle was our first sightseeing stop. Bear with me a little—there are so many names to remember! 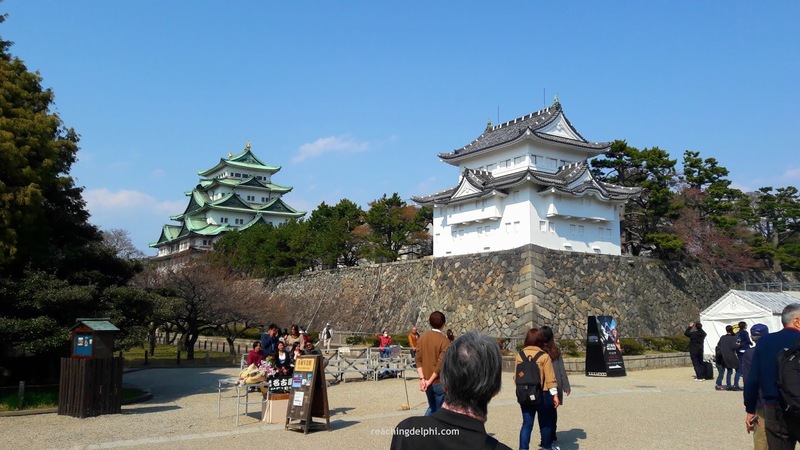 Nagoya Castle was built initially by Imagawa Ujichika in the 1520s. In 1532, it was seized by Oda Nobuhide. The castle was abandoned after the 1580s, and at the same time, there were several violent outbreaks or disruptions in the region. Tokugawa Leyasu turned out to be the victorious leader, and he rebuilt the castle in 1609. The Tokugawa clan was a very powerful and influential family in Japan. Under Tokugawa, the castle flourished, and as a feudal lord, he had general authority over others. Let’s fast forward a few hundred years. Almost all of Nagoya Castle was destroyed during World War II. The surviving artefacts were kept safe, and they have been reused when rebuilding the structure after the war. Here are some pictures around the beautiful castle. Do you see the blooms? Shogo San referred to these as half-blooms. 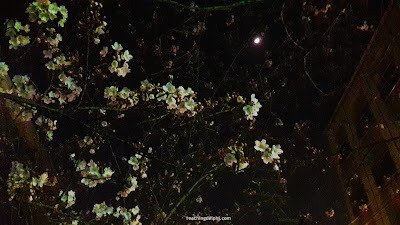 According to him, the half-blooms create a very calm and serene atmosphere. If you listen carefully, you can hear them whisper, he told me. We took our time to admire the petals in the making. I am pretty sure I heard the humming serenade of leaves and flowers, and then that whisper. It was hauntingly peaceful. Nagoya Port, the largest and busiest port in Japan, is an hour’s drive from Hiroko San’s residence. Located in Ise Bay, the port area is Shogo San’s favourite spot. He comes here regularly for inspiration and for his canvas-subjects. Yep, he’s an artist, and I am a proud owner of one of his autographed paintings. 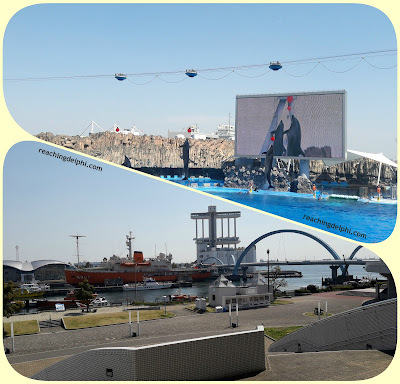 Port of Nagoya Public Aquarium is in the port area. 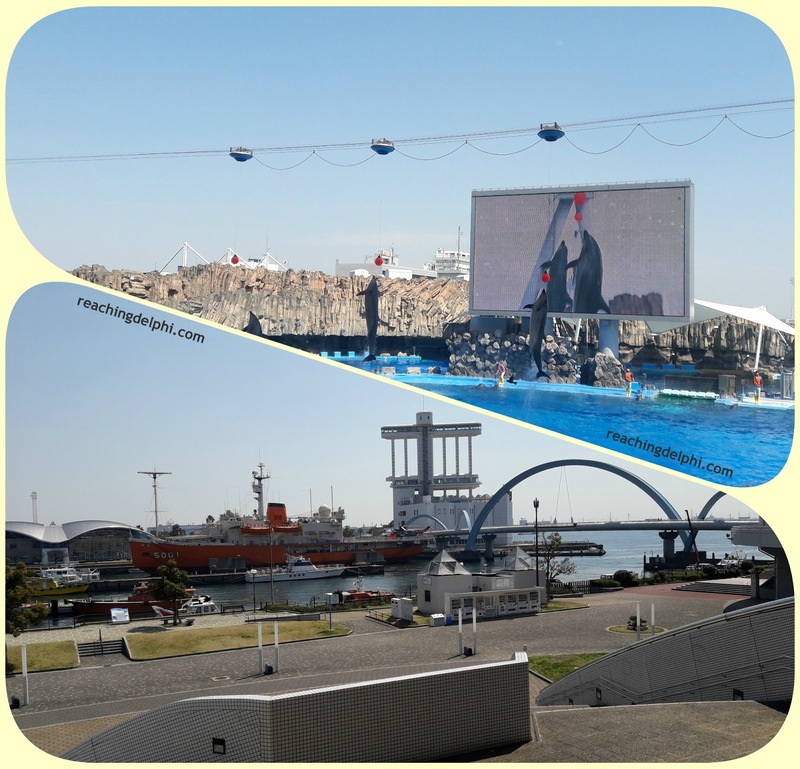 We got a chance to visit the well-maintained aquarium and catch a friendly dolphin show. Those dancing dolphins were so well trained, their performance flowed rhythmically. There are so many different attractions in Nagoya. These include the famous Toyota City and Toyota Museum, the colourful Korankei Park, and Legoland. However, since we were down with a rather bad pollen attack, our travel was somewhat limited. 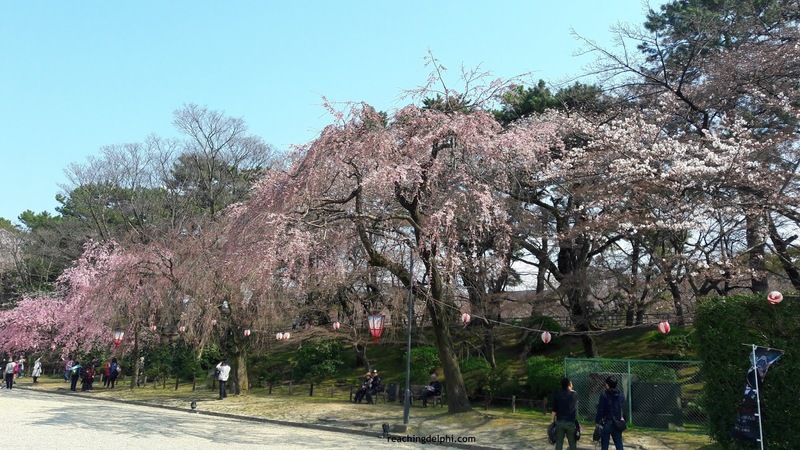 You’ll find parks of varying sizes all over Japan. 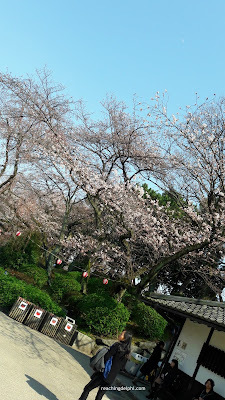 With the help of a couple of anti-allergy pills and lots of hot green tea, I got to enjoy many long walks and chats with our hosts in the blossom-lit neighbourhood. Hotels in Japan can be rather expensive, but you can still find alternative options. Check out this post, Why pay more? Grab the best hotel deal possible, for ways on how to get better hotel deals. 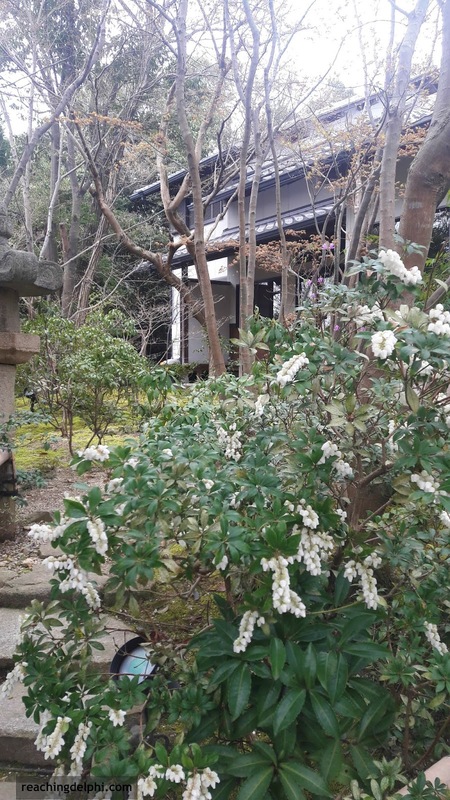 To experience a local flare in Nagoya, try Japanese-style accommodations, like Ryokan or Minshuku. 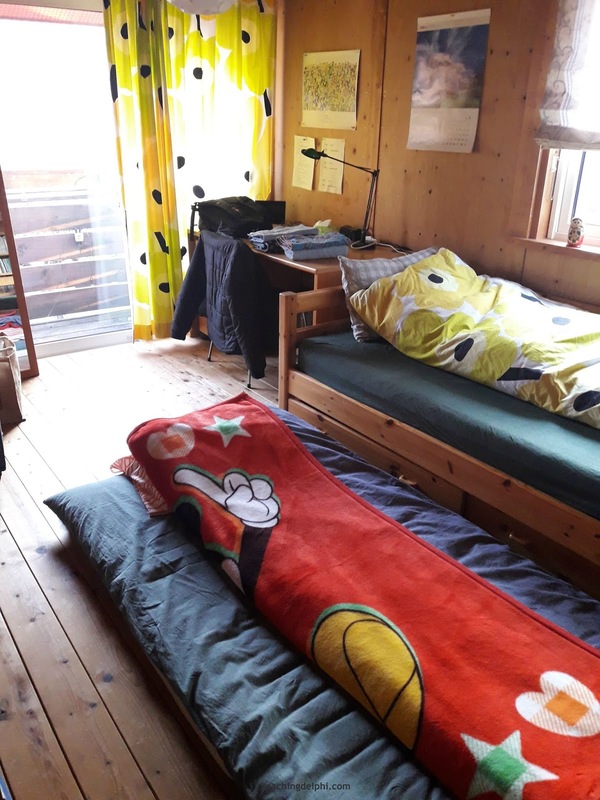 We didn’t want to trouble our friends, so we booked a room at an eco-friendly Airbnb, partly Minshuku style. Nobuyo San and Fujiko San were our lovely hosts. 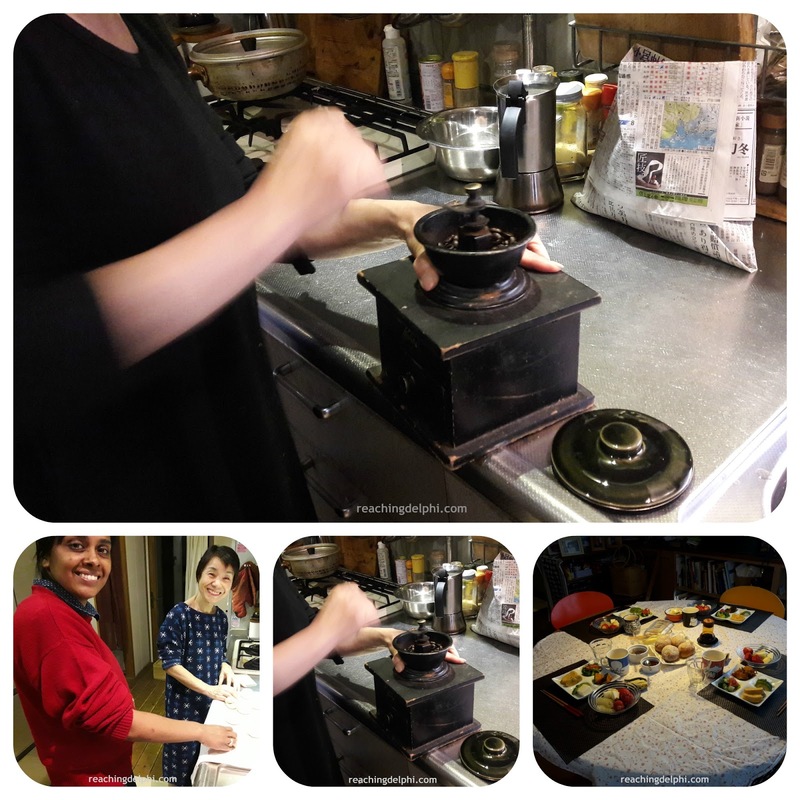 Fujiko prepared a great local vegetarian meal for us, and to top it off, she grounded freshly roasted beans to satisfy our caffeine needs. Those hot coffees helped ease up the nasal passages. Fresh brew. Look at the awesome breakfast! Hiroko San insisted we stayed with her for the remaining trip, so we said “Arigato” and “Sayonara” to Nobuyo and Fujiko San and stayed with Hiroko and Shogo for a few more nights. 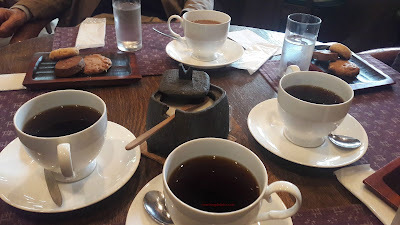 Coffee is a huge deal in Japan. We visited an art-cafe belonging to Shogo’s friend, which I absolutely loved. The zen-like surrounding and fragrance of the fresh, hot brew would definitely make this place one that inspires new ideas. 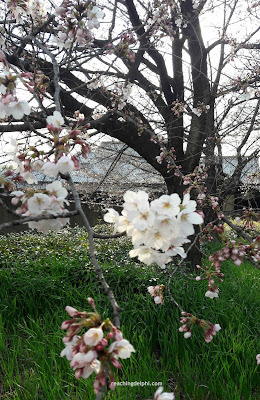 I did not look out for cherry trees specifically, but there were plenty of plants around. Inside, we ordered delicious fresh-baked cookies with our coffee. I wished I didn’t have to get going to our next destination. 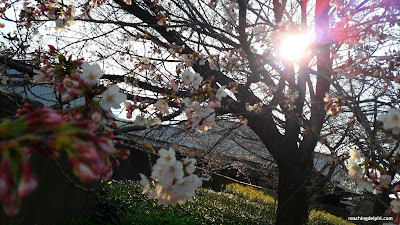 All good relationships bloom gracefully like the delicate Sakura. And just as the spring flowers, they too are present in our lives for a while but create a lifetime of pleasant memories—memories of the seasons that return time after time. 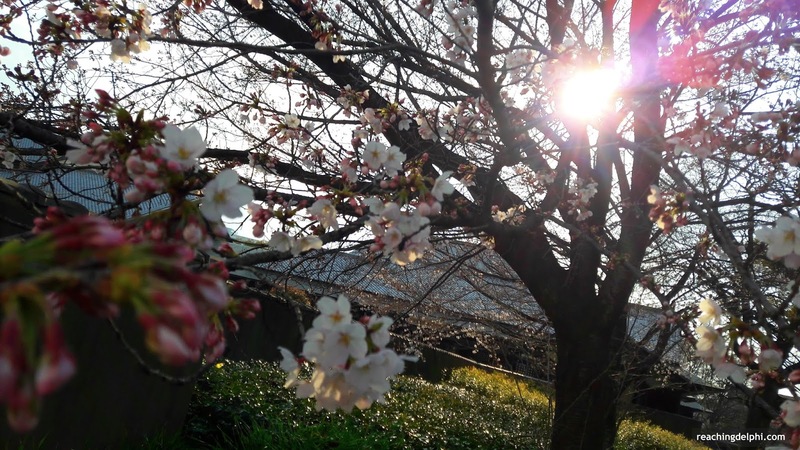 It may no longer be cherry blossom season when you read this post, but as long as the sun shines, there will be another opportunity to see the beautiful Sakura. 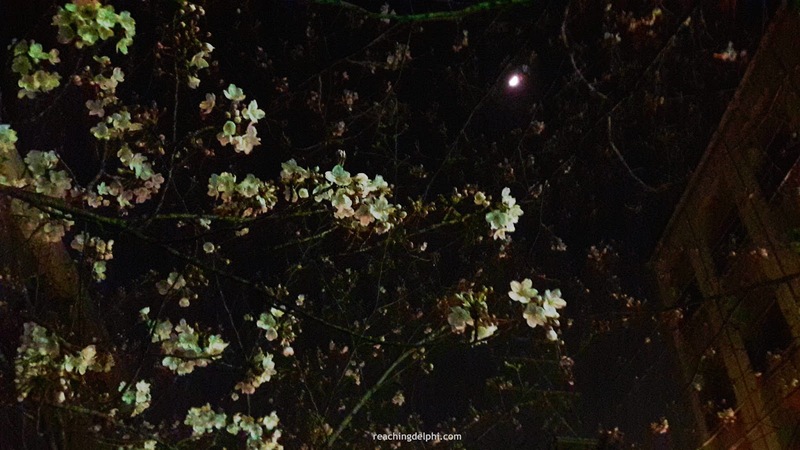 I can still hear those whispers, the unspoken words of the flowers … of silence … Counting Stars, Reaching Delphi. See you again in Part Three. "Silence is full of untold."